Hip pain, back pain and even menstrual cramps can impact your sleep which can then negatively impact many other aspects of your life. Think of sleep as the first domino to fall bringing down work productivity, quality time with the family, and even your overall health. Fortunately, an economical and effective way to beat those aches and pains is with a knee pillow. You can avoid a trip to your chiropractor just by sleeping with a pillow between your legs. But not all knee pillows are created equal so before you run out and buy one, there are some things you should know. Some are better than others in terms of quality, but not only that, there are different shapes and sizes that will treat certain conditions. With that said here’s a quick look at my top choices of knee pillow. It’s amazing how much a simple, no-frills product can do for your sleep and overall health. Distributes pressure evenly – Side sleepers know too well that it’s hard to sleep without knee stacking. The problem there is that it puts pressure on the hips and spine. Keeping the knees apart also helps align the spine to prevent back pain. Improves Circulation – If you’ve ever experienced a garden hose with a kink in it that blocks the water, then you can imagine what happens to your blood flow when your joints are not aligned. Opening that up keeps the blood flowing and supplying oxygen to muscles. This reduces soreness in your muscles either after the gym or just from your everyday life. Eases Sciatica – Keeping your hips and legs apart eases pressure on the sciatic nerve. People that suffer from minor sciatica can prevent a flare up and reduce the pain associated with sciatica when an episode does strike. Improves Comfort During Pregnancy – A pregnant stomach poses a myriad of issues concerning alignment. Ask any pregnant woman what the worst part of being pregnant is and expect a majority to say the discomfort when trying to sleep. A knee pillow can help a pregnant woman by taking pressure off of the hips and back. Add a pregnancy pillow to the mix and you’re bringing bliss back to bedtime. 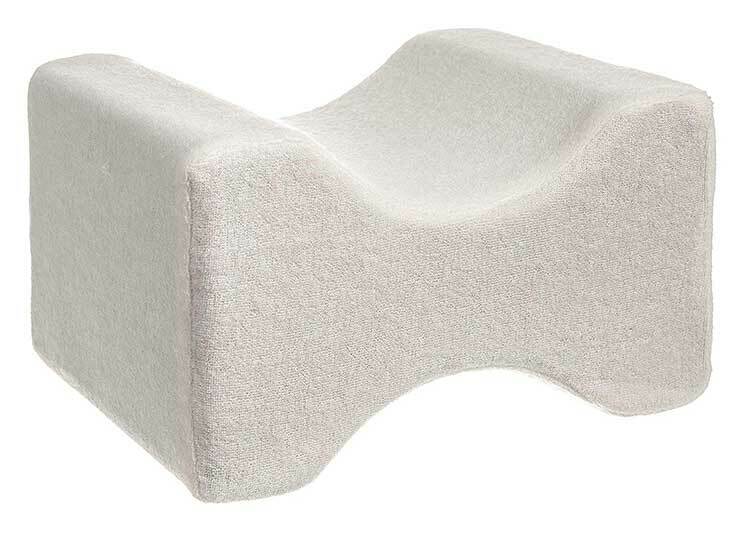 Though all knee pillows will give you the benefits listed above, the shape and type do matter. As you will see by the list below of the different forms a knee pillow can take, each one has its strengths against certain conditions. Let’s take a deeper dive into the different shapes of knee pillow so you can decide which is going to work best for you. 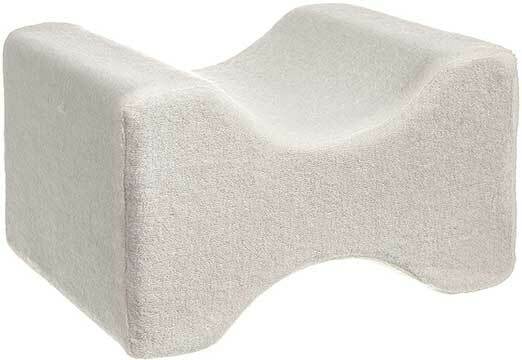 The knee pillow most people think of when they hear the term is the hourglass shaped one. This has indents on the side to keep it from moving around at night. 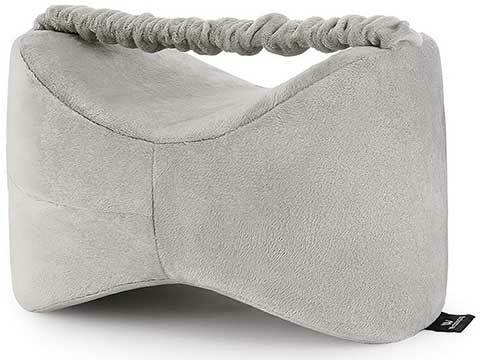 This is the best knee pillow for side sleepers since it will keep your knees from stacking. One downside to this shape is that if you toss around at night then you may find it doesn’t stay with you. It is quite versatile, however since you can use it under one leg only to keep a foot raised, for instance. For use between the legs it can be positioned between the shins or thighs as well as the knees. For those that sleep in different positions at night, having a secured leg pillow is very helpful. They can be hourglass shaped, or just flat, but the important aspect is that it moves along with you during your sleep. Position it wherever you like and fix the strap to where it is comfortable. Now, no more waking up to find where your knee pillow ended up! The point is to improve your sleep and waking up to look for a pillow definitely won’t help that! Using a half moon wedge knee pillow gives a lot of different options for sleep positions and can be used for a multitude of pains and ailments. It can be used under the knees, under the ankles, between the legs and even other parts of the body like at the lumbar while sitting. There is a spot for any position so whichever way you prefer to sleep, you will find it can accommodate. With a 45° angle, the shape is ideal for use for knee support under the legs to keep them elevated. It can really only be used by back sleepers, but it does a number of jobs for many different conditions. Even aside from the types of knee pillows, there are other factors you should consider when buying a leg cushion. Material: Lately the most common material is probably memory foam. It is comfortable and forgiving, hypoallergenic and antimicrobial. They can also cause sweating and are somewhat pricey. Alternatives are latex, water gel and polyester blends. Firmness: Different than the thickness is how firm it is. This is subject mainly to personal preference as some will like it more or less firm than others. But it should have some give to it to be comfortable in most cases. If it is too firm, it may not align the spine properly. Thickness: A very thick cushion with little give will likely result in your legs spread too wide to provide the proper alignment of your spine and lower body. Look for 4 to 6 inches of thickness with some give to find the right amount of space to keep your legs properly aligned. Now that we are at the heart of the article, namely the reviews, I will go over the best knee cushion according to the type so you can really narrow down which is the top choice for you. The side sleeper that needs a leg cushion that is as comfortable as it is effective need look no further than the Livivio. The small profile is ideal for use between the knees or shins or thighs. You can prop up an ankle or a whole leg. There are two things about it that separate it from the masses of knee pillows on the market. The first is the type of memory foam. It is quite durable and firm, yet has just the right amount of give. And, like other memory foam, it bounces right back to form so it never needs to be readjusted. The other aspect that I really like is that it has a comfortable, removable cover. The material is a type of soft velour that feels great against the skin and does whisk away some body heat to prevent overheating. Even better is the fact that it can be washed. If you are somebody who doesn’t stay in one position during the night, then you’ll appreciate the lightness of it so you can still keep it between the legs even when rolling over. Conditions such as back pain, hip pain or sciatica can be relieved due to the ideal width to keep your legs separated. Post operation recovery is also something that the pillow can be used for. If you have recently had a knee replaced then I highly recommend this cushion. Just like the Livivio this is an hourglass-shaped knee pillow that goes between the thighs, knees or shins. With the added bonus of an adjustable strap to keep it in place. You can make it as tight or as loose as you need it. Since it is covered in a soft, breathable material it won’t rub against your skin causing irritation. The entire cushion is covered in the same material to prevent any chafing or sweating while you are trying to rest. In case you don’t like the strap then you can swap out the cover for one that doesn’t have it. Made out of natural latex, it is hypoallergenic and resists mites and bacteria. Latex is very much like memory foam, but it is a bit more firm and will never compact. If you like the comfort of memory foam but would like more support, then you should go for latex. The latex does weigh it down some so when you move it might feel heavy. That is where the strap comes in, though, to prevent it from being a burden. As with other hourglass shaped leg cushions, it is ideal for those that are suffering from sciatica, pregnancy discomfort, hip and joint pain and when recovering from an operation. Since this is an article about knee pillows, I will focus on that aspect. 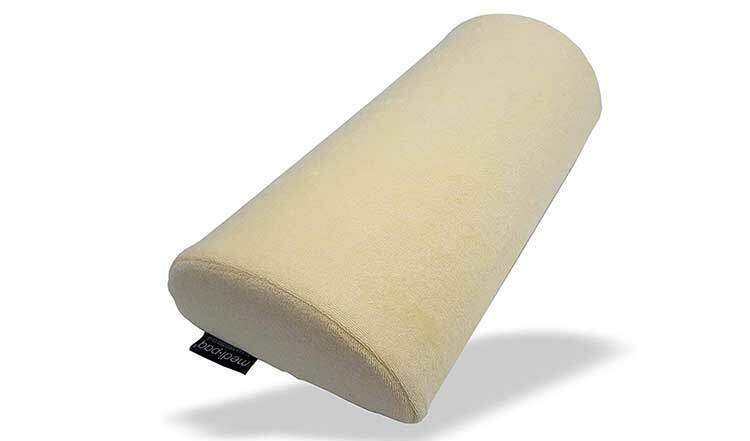 Just keep in mind that one of the nice features about this particular wedge knee pillow is that it serves many purposes and not solely for your back or leg pain. Though, for that purpose it is fantastic. This is especially handy for back sleepers that need to relieve the pressure from their lumbar region. Lying on your back with this under your knees will bring your spine back into its natural shape taking the pressure off of your lower back. Of course, it can be used by side sleepers as well. Between the legs or even just one leg since it can be moved wherever you like it due to its shape and length. 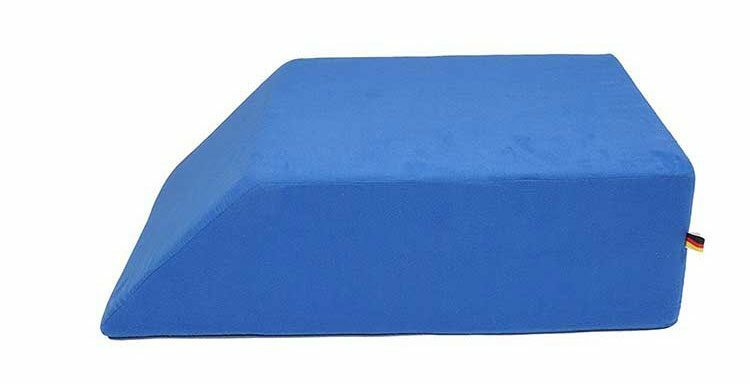 The memory foam is made out of 4-pound density so it can handle the support. It still feels soft and will bounce back, but it has the strength and durability to handle prolonged use. Another fantastic feature is that it uses the latest generation of memory foam that is much more breathable than ones in the past. If you are hesitant to go for a memory foam pillow because you fear sweating excessively, then you don’t need to worry with the Medipaq. Recovering from foot or ankle surgery? Have restless leg syndrome or edema of the feet? Then getting your lower legs in a “0 Gravity” situation is ideal to help keep swelling from your lower extremities. For those suffering from menstrual cramps, this is also an ideal posture to ease the pain and discomfort. 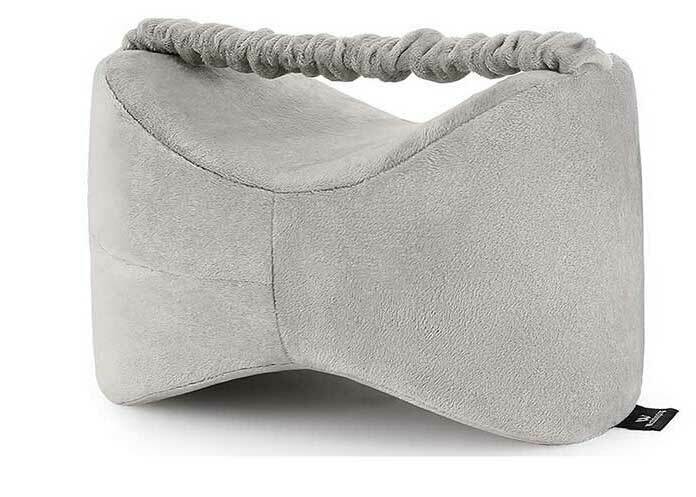 With a width to accommodate any size legs within 50cm, there are few people who will be asking for extra room for their legs.The height of this wedge knee pillow is quite high so it has a weightless effect on your legs. By positioning your legs in this way, it will curve your lumbar of your lower spine to relieve any pressure from that area. It also brings a flush of blood to your lower back to keep the muscles relaxed. 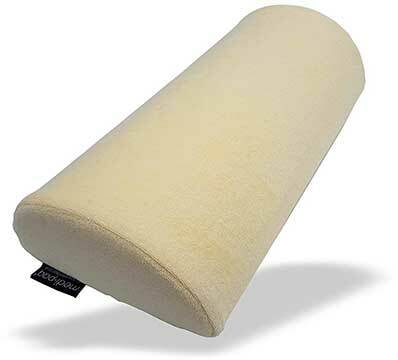 The cushion is made from a durable foam, though it is not quite a memory foam. There isn’t much give to it in other words. Not to worry, it is not rigid or uncomfortable. It just doesn’t have that give that memory foam does. There are a couple of things that should be mentioned, though I don’t consider them negatives. One is that the wedge is quite heavy so it is not easy to move around. This is good for support since it won’t move while you’re in bed, but the elderly may need a hand with it. The other is that people with shorter legs may find the angle a bit steep. Do Knee Pillows Work? Are They Worth It? With so many wild claims being made on the internet these days, it is a valid question. The short answer is, yes, they do work and, yes, they are worth it. This isn’t some new pseudoscience. For decades people have known that correcting your spine alignment is fundamental in easing your back pain and preventing it from returning. As long as you follow the tips outlined above and get yourself the best knee pillow for your needs, then you should see some results. Of course, nothing can substitute the word of your GP, so if you try a knee pillow and feel like it isn’t working then you should seek a medical opinion.